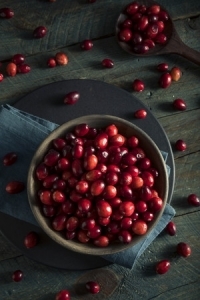 Since Inflammation has been linked to just about every chronic illness in the Western world such as heart disease, diabetes, cancer, Alzheimer’s and many other condition including obesity, we should consider consuming more cranberries. In addition, recent research from UMass Medical school reports the first evidence that certain beneficial gut bacteria can grow when fed a carbohydrate, called xyloglucans, found in cranberries. This substance is considered a prebiotic which acts as food for the healthy gut bacteria. These healthy gut bacteria also help to quell inflammation. Cranberries are a good source of vitamin C, fiber, manganese, vitamin E, K and copper and a well-known way to prevent urinary tract infections by fighting bacteria that stick to the lining of the urinary tract. These beautiful ruby berries are also loaded with phytonutrients such as quercetin and anthocyanidins. Quercetin is a little-known nutrient that is a powerhouse phytonutrient providing high anti-oxidant activity. It has been shown to be of benefit in allergies, reducing inflammation and improving joint pain. Anthocyanidins are common plant pigments with a powerful punch when it comes to nutrition. They are primarily known for their antioxidant and polyphenol properties. But the challenge with cranberries, is that they have a very tart flavor, so we tend to add quite a bit of sugar to make them more palatable. Dried cranberries, for example, contain the equivalent of slightly more than one teaspoon of sugar per tablespoon of berries! The sugar reduced products are slightly better and weight in at about ¾ of teaspoon of sugar per tablespoon. Since sugar is one of the most inflammatory foods that we eat, it pays to be careful here. This doesn’t mean you shouldn’t eat them. Just be judicious with your portion sizes and use them by adding them to other low sugar recipes like the Brussels Sprouts, Kale and Dried Cranberry Salad recipe. Thanks to my friend Colleen for the recipe inspiration! But, what would Thanksgiving be without cranberry sauce on that beautiful plate. Rather than using store bought cranberry sauces which are loaded with sugar, this year try making your own. It really is simple and easy. Check out the recipes here Low-Sugar Cranberry Sauce and Low-Sugar Cranberry Zest. Ruth Clark is a Registered Dietitian Nutritionist with a B.S. in Human Nutrition, a Master’s degree in Public Health from Boston University and over 35 years of experience in the health care field. She has held positions at both Harvard and Tufts teaching hospitals, corporate America, and was formerly Executive Director of Wellness Programming for the Deaconess Hospital in Boston. In her nutritional counseling practice, Smart Nutrition, Ruth is committed to helping each client reach long term permanent results on their journey to optimal health. Reboot Your Hormones to Increase Energy and Burn Fat.